It was a Sunday night and we expected to be jetlagged after just arriving in San Francisco the day before from Singapore. From experience, we rarely enjoy our second dinner after a long flight, so we learnt from experience not to make reservations at any of the top restaurants which we look forward to dining at. 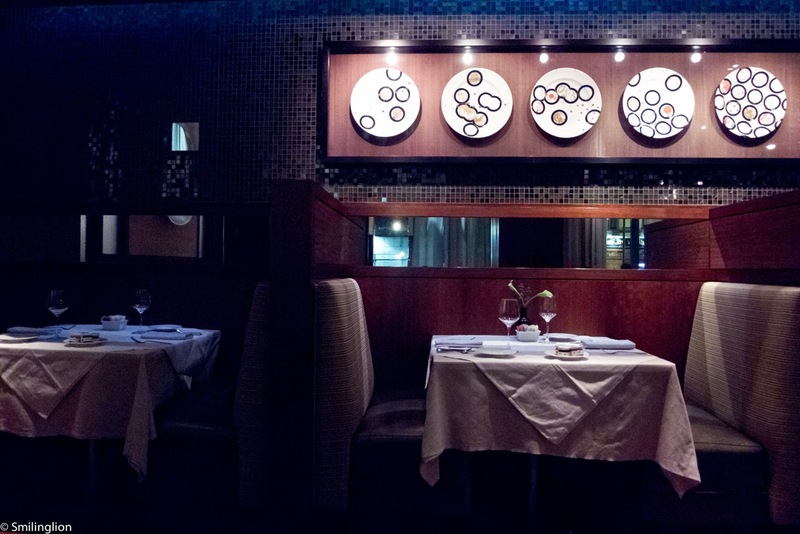 This is not meant as disrespect to Luce, which is a one Michelin restaurant located in the Hotel Intercontinental off Howard Street, but from our research before we made this trip, it wasn't a much talked-about dining destination. We booked dinner here only because it looked to be the next nearest decent restaurant from our hotel (and we had dined at the nearest, Ame, the previous night). From its name (Luce, which is in fact taken from the iconic Italian Supertuscan wine), we had assumed that the cuisine on offer was Italian, although it turned out that Chef Daniel Corey specialises in contemporary American cuisine instead. The restaurant, being an extended part of the Hotel Intercontinental lobby with no visible barrier demarcating the spaces, had a very casual ambience and a bit of the lobby lounge cafe vibe (they didn't take our coats when we came in). We thought that the wine list here had quite a good range, and as tempted as we were to order some big name French wines (some of which we thought was good value), we chose in the end to go local and pick out a Larkmead Cabernet Sauvignon 2007 from Napa Valley, which was an excellent wine from a very good vintage. It turned out to be the right choice as the Cabernet was delicious and got better throughout our dinner. As the restaurant didn't do any tasting menus on Sunday night, we had to make do with a very short a la carte menu instead. 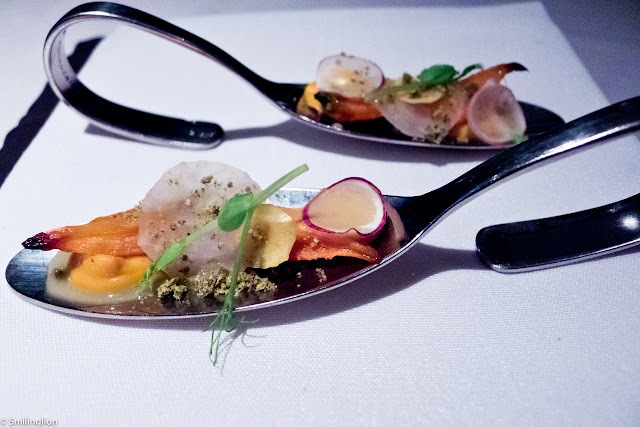 Amuse bouche of root vegetables was served while we were making our food decisions. 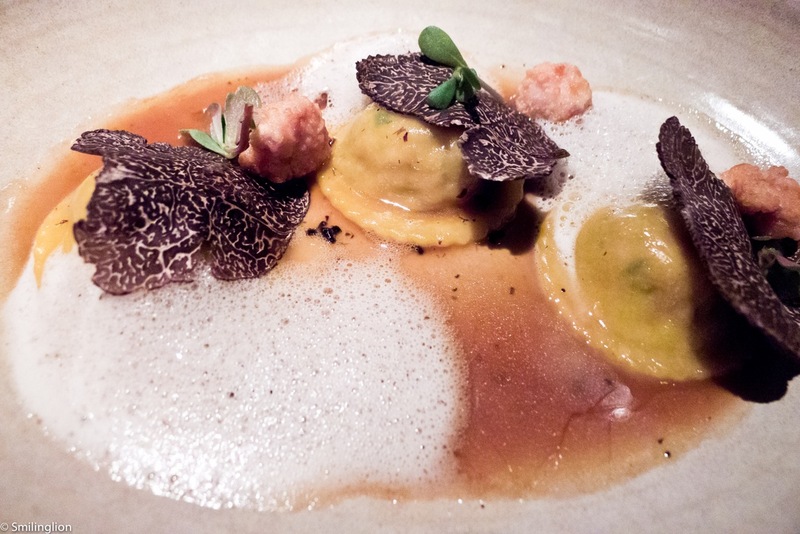 Handmade sweetbread ravioli, crispy sweetbread, truffle: This was a dish executed with some finesse. The sweetbreads, especially the crispy ones, were simply divine and the black truffle reduction was rich and luxuriant with flavour. 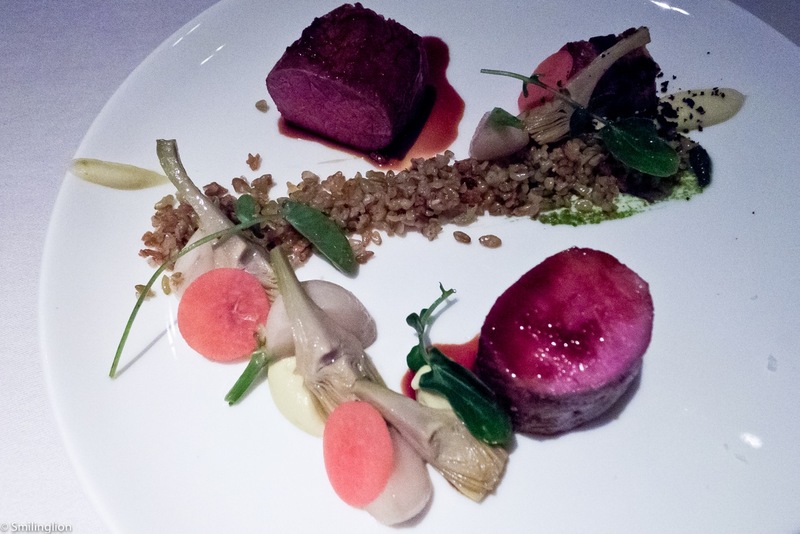 Herb roasted lamb loin, crispy belly, scarlet turnips and baby artichokes, fresh coriander, toasted green wheat: The lamb was cooked with precise doneness and without any of the usual strong flavours brought about by lamb fat, and the sauce was done in the classical style. This was very good. Breast of guinea hen, roasted in salted butter, leg confit, smoked date puree, new potato and onion: We thought that this dish defined this restaurant. It highlighted the freshness of local produce and the mastery of cooking technique coupled with the appropriate use of sauces. 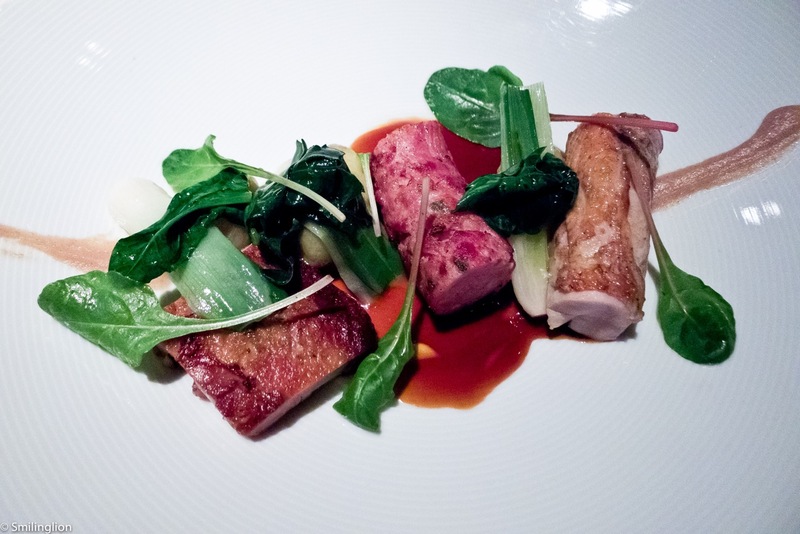 The trio of guinea breast, thigh and sausage was flawlessly balanced with the greens (the leeks in particular) and the smoked date puree. This was Californian cuisine at its finest. 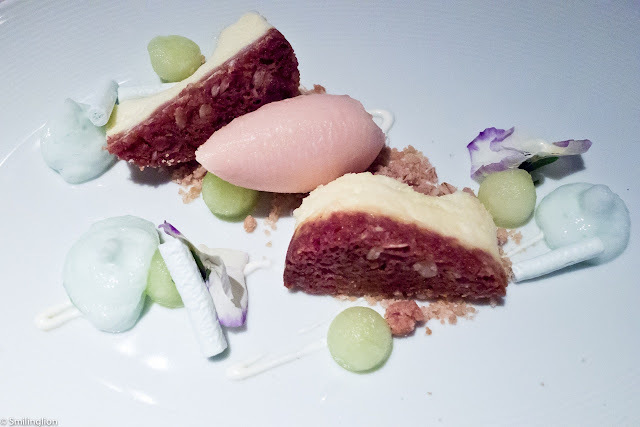 Mascarpone cheese cake, green apple: This looked better in the menu than it turned out. It was reasonably good, but relative to the rest of the meal, rather disappointing. We thought that the green apple was too tart and overpowered the rest of the dessert somewhat. 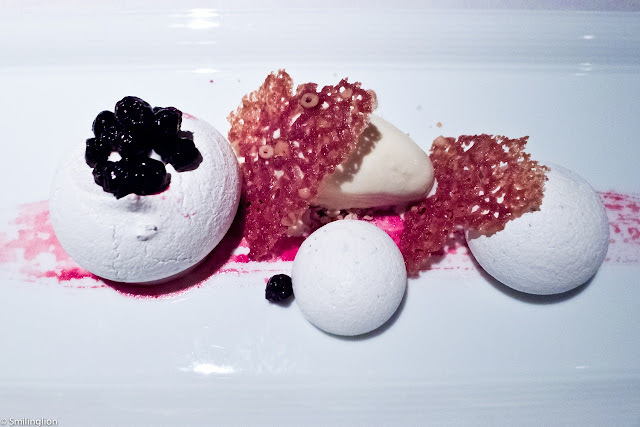 Rosemary infused pavlova, lemon mousse, pine nut ice cream, huckleberries: We loved this dessert. The meringue was amazing and the pine nut ice cream, delightful. 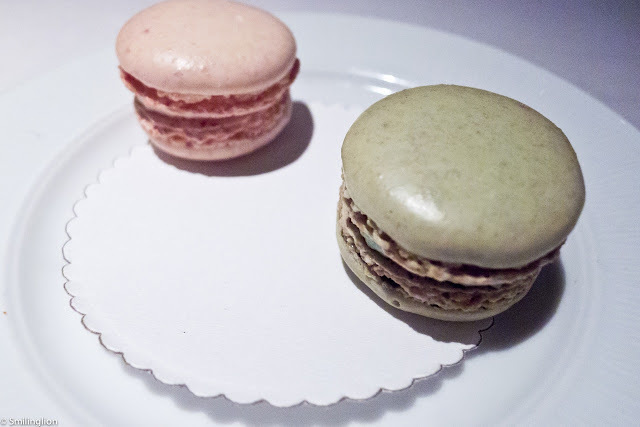 We ended our dinner with a couple of quite decent macaroons. Impressions: We did not expect to have such a good meal here. It was a Sunday evening and we wanted to go somewhere near to our hotel for a relatively simple meal. Luce was indeed quite a simple restaurant (the unremarkable decor, the ambience of a hotel lobby cafe and the short and unfancy menu) but the execution of the food here was very impressive. The servers all had an almost unnaturally high level of enthusiasm which made dining here fun and casual, and for a 'simple' restaurant, it had a pretty impressive wine list.